An unexpected fire destroyed 16 units in the Tanglewood Apartments on Hanford Armona Road Sunday morning. 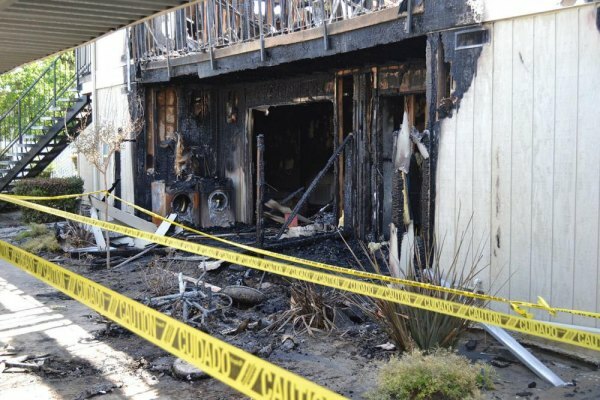 Residents of the Tanglewood Apartments on East Hanford Armona Road got quite a scare Sunday morning when the calm morning was suddenly violated by the sound of screaming fire engines and cries of firemen and Lemoore police officers. A major fire erupted at the complex at about 10:45 a.m. Sunday. It sent a number of apartment dwellers scrambling as the fire began to spread to apartment after apartment. Lemoore police officers, the Lemoore Volunteer Fire Department, and the Kings County Fire Department quickly arrived on the scene and began fighting the fire. Police officers arrived first and found several apartments fully engulfed in flames. With the assistance of Kings County Sheriff's deputies, the Lemoore officers were able to evacuate all tenants in the burning building as well as the surrounding apartments. The volunteer firefighters and Kings County firefighters fought the fire for about six hours, keeping it from spreading to additional apartment buildings. Sixteen apartments were destroyed as a result of the fire. The damage was so extensive that the building has been condemned. Two tenants were treated on scene for minor injuries. A Lemoore police officer suffered from smoke inhalation. He was treated and released from the hospital. A firefighter received a minor injury and was treated on scene. There were a number of onlookers and officials at the scene on Friday inspecting the damage. Insurance investigators were also on hand asking questions and surveying the scene. Carpets in fire-damaged apartments were water logged and the smell of smoke lingered in the air as residents were seen rummaging through the debris looking for something to save. A Lemoore Police Department chaplain responded and was able to arrange for hotel rooms for the victims of the fire. The American Red Cross also responded to provide assistance to the displaced tenants. Lemoore Volunteers in Policing were called in and assisted with traffic control during this incident. Sheriff's deputies assisted with handling patrol calls until additional Lemoore police officers could be called in. Kings County Fire Investigators responded to the scene to try to determine the cause of the fire, which is still under investigation. Anyone wishing to make donations can contact the American Red Cross at 1300 W. Shaw Ave., #4B Fresno, CA93711, (559) 455-1000.